Colorado Hospital Association (CHA) is the leading voice of the state’s hospital community, representing more than 100 hospitals and health systems throughout Colorado. The Association’s mission is to support members’ collaborative commitment to advance the health of their communities through affordable, accessible, high-quality health care. CHA serves it member hospitals and health systems in a number of ways, including legislative policy and advocacy, The Center for Health Information and Data, education and events, and the Colorado Telehealth Network. Project Summary: Between June and November 2017, CHA worked with select member locations in Colorado to help curb the rise in opioid use. 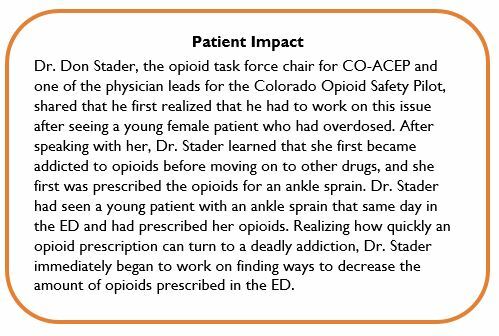 The project, the Colorado Opioid Safety Collaborative, implemented the 2017 Opioid Prescribing and Treatment Guidelines, developed by the Colorado Chapter of the American College of Emergency Physicians (CO-ACEP). These guidelines were developed to help emergency department (ED) clinicians reduce the amount of opioids administered and, instead, use alternatives to opioids (ALTOs) as a first-line treatment for pain. A crucial part of the pilot is the collection of data on the efficacy of ALTOs and establishing best practices surrounding pain management. Successes: The goal of the pilot is to reduce opioid administration by ED clinicians by 15 percent. During the six-month pilot, the 10 EDs reduced opioid administration by an average of 36 percent and an increase in the use of ALTOs of 31 percent. In November 2018, after another full year or measurement, the sites achieved an average reduction of 62 percent, when compared to the baseline time period. Anecdotal feedback from the pilot program indicate that providers are glad to employ new techniques (e.g., trigger point injections), and the outcome for patient satisfaction did not change during the pilot, showing that patients still felt their pain was managed during their visit. In addition, the public has become so aware of the opioid epidemic, that most patients are glad to have a conversation with their ED provider about these alternatives and how to best treat pain without needing an opioid. Challenges: For so long, opioids have been the go-to prescription for pain management and many providers had to work to change their habits. Impact: Following the successful pilot in 2017, CHA rolled out the Colorado ALTO Project to make this effort available to all Colorado EDs. The Association has trained more than 60 acute care hospitals and 50 have either launched or have an implementation date for the program. The program is also receiving national attention, with other state associations and health systems reaching out to CHA with questions about implementation and funding for ED ALTO projects in hospitals nationwide included in the 2018 federal opioid legislation. 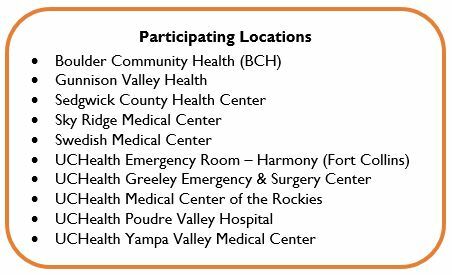 CHA would like to thank their partners on this project: the CO-ACEP, the Colorado Consortium for Prescription Drug Abuse Prevention, Telligen, and the Colorado Emergency Nurses Association.